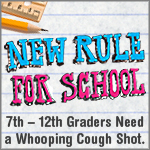 This is just a reminder that a new school immunization law requires all students entering 7th through 12th grades in the 2011-2012 school year in California to be immunized with a pertussis (whooping cough) vaccine booster called Tdap. As stated by the CA State Government-affiliated organization, Shots for School: Pertussis is a very contagious respiratory disease that can be severe and last for months. The immunity received from either early childhood immunization or pertussis disease wears off over time, leaving older students and adults susceptible again to pertussis. Immunization with Tdap can protect students, schools and communities against pertussis. For the 2011-2012 school year, all students entering into 7th, 8th, 9th, 10th, 11th or 12th grades will need proof of a Tdap shot before starting school. For 2012-2013 and future school years, all students entering into 7th grade will need proof of a Tdap shot before starting school.